Are you crafty? Are you looking for some inspiration for creative projects to fill your summer months? Look no further! We have aggregated a few super cool resources FULL of ideas for crafting with MAPS! Instead of recycling your old maps or atlases, upcycle them! If you don’t have any outdated maps on hand, shop for them at your local used book store. Whether you’re creating these for your home or classroom, doing these projects alone, with your friends, or with your kids or students, you are sure to have hours of fun and make pieces that you will cherish. Seven Summer Travel Inspired Travel Crafts from Everything Etsy. Check out a great collection of projects to make everything from jewelry to home decor, magnets and more! “Map Crafts for Kids” on Pinterest. For kids crafts of all ages and skill levels. Try these ideas at home this summer with your kids, and hold onto the links for your classroom next fall! “Map Crafts” on Pinterest. With a slightly different set of search criteria, you get a totally different collection of results! 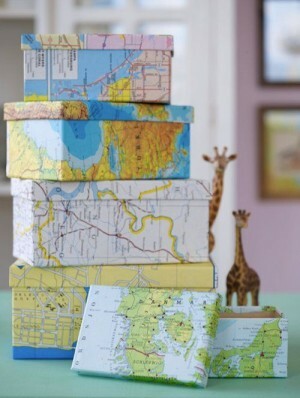 These map projects are more sophisticated and will give you a summer full of inspired crafting!